A 1D block cellular automata (bCA) model for granular systems that conserves the number of particles has already been proposed. Here, we extended the model to include elastic and inelastic collisions and obtain the thermodynamical relations in the dynamics of the 1D bCA model for a bounded case. The grains are reflected by the wall boundaries elastically (coefficient of restitution r=1) while the collisions are generalized to any value of r. We identify the pressure p as the average momentum transfer to the walls of the 1D container quantified by the average number of elastic reflections on either wall. The temperature T is identified as the average kinetic energy of the system quantified by the average number of cells in the moving state. We find a linear relationship of pressure and the product ϕ0 K0 with a slope of R = 0.5 in comparison to the gas constant in the ideal gas law. D. Biton and J. Bantang. 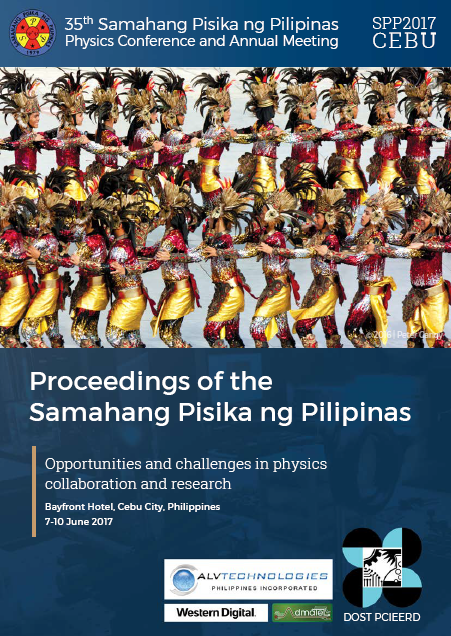 Thermodynamic relations in a 1D block cellular automata model of a shaken granular system, Proceedings of the Samahang Pisika ng Pilipinas 35, SPP-2017-PB-25 (2017). URL: https://paperview.spp-online.org/proceedings/article/view/151.